Your choice of beef cattle breed(s) plays a vital role in your success in the pasture-based cattle farming industry. It's not a choice that should be taken lightly. This article explores key differences between beef cattle breeds and explains how to choose the right breeds to suit your farm's climate and production strategy. Step # 1: What's your beef production strategy? Are you grass-finishing animals, selling weanlings, or taking yearlings to the auction? If you grass-finish your cattle, do you want smaller-framed calves that finish before their second winter or is your production strategy and climate suited to larger-framed cattle that finish heavier at 24 or 36 months of age? Do you want a finishing (and slaughter) season that lasts as long as possible so you can supply fresh beef over an extended time span or do you want a single short harvest in the fall? Is there a price premium or marketing advantage to one breed or another to cater to buyer preferences in your area? Are you calving on pasture in a grazing rotation or far from home on a government grazing lease deep in the wilderness? Before settling on any specific cattle breed, design your production strategy so it meshes with your environmental constraints and fits the specific market you are trying to supply. I cover this process in detail in my book Grass Fed Cattle - how to produce and market natural beef. Know your business, then choose the right breed; breed choice is merely a tool to make your business work. Step #2: What kind of environmental and climate challenges will your cattle face on your farm? The next step is to identify the specific environmental and climate conditions that your cattle will face on your farm. This determines what specific traits to look for when you begin assessing potential breeds. What kind of winter weather do you expect your cattle to endure? Will your cattle need to graze through snow? What kind of summer weather will your cattle endure? Mild or searing heat, dry and dusty, or suffocating humidity? How severe are the temperature fluctuations between summer and winter? Will your cattle face the extreme temperature swings of the Texas plains or a uniform climate with only modest temperature changes between seasons? What kind of soils will your cattle be on - rocky, boggy, wet, or dry? Do they need feet capable of withstanding rocky treks through the mountains or slow growing hooves that won't need constant trimming on soft boggy ground? 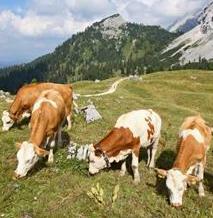 Will your cattle travel long distances high in the mountains or wander casually from one adjacent pasture to the next? What parasites will your cattle face? Farms in tropical climates should look closely at the tropical cattle breeds because of higher resistant to tropical parasites. Is bright sunlight (eye strain) an issue in your area? Would your cattle benefit from pigment in the hair around their eyes to reduce glare and and eye-strain? Eye-strain increases vulnerability to pinkeye disease. Do your cows need particularly strong mothering instincts to protect against predators and to keep track of their calves in a mountain grazing scenario? Are horns an asset for protection against predators? Is de-horning an option or would polled cattle be better a better fit for your farm. Horns are a leading cause of bruised meat, which must be discarded during slaughter. Many cattle buyers dock horned cattle with a price discount when they buy cattle destined for a feedlot. As you can see from this brief list, clearly identifying the environmental challenges and production strategies that your cattle will face on your farm allows you to look for very specific characteristics once you begin evaluating beef cattle breeds. Step #3: Browse through the world's cattle breeds to find the perfect match for your farm. There is no such thing as the perfect beef cattle breed, just the perfect breed or breed combination to suit your farm's climate, production strategy, and unique market opportunities. Every breed has an edge. Finding the breed that has the unique adaptations suited to your farm simply requires digging a little deeper into their ancestral climates and breed histories. The tropical breeds (Bos inducus) evolved from domesticated Asian aurochs. They are also commonly known as Zebu Cattle and are easily identifiable by their characteristic shoulder hump, which the European cattle breeds lack. The European breeds (Bos taurus) evolved in Europe and in the Fertile Crescent. The European beef cattle breeds were domesticated independently from Zebu cattle. Archaeologists even suggest that European breeds do not all have a single source, but rather that there were multiple simultaneous independent domestication events. DNA studies reveal that wild European aurochs contributed greatly to modern European cattle genetics, though not uniformly, with only a little genetic contribution from Northern European aurochs, but much more from Southern European and Middle Eastern aurochs. The European beef cattle breeds are further divided into British Breeds and Continental Breeds based on whether they evolved on the British Isles or on the European continent. 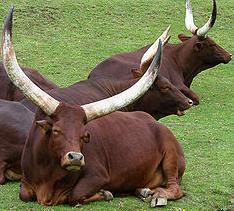 Then there are Sanga Cattle (Bos inducus africanus). 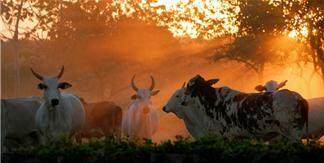 They are a subgroup of Zebu Cattle, which are specific to Africa. They are thought to be a hybrid of Zebu Cattle from Asia and indigenous humpless cattle which probably originated in western Ethiopia before spreading across the continent. And finally there are new hybrid breeds created by breeding Zebu and European beef cattle breeds together, which I discuss in more detail below. Cattle are also grouped based on the purposes for which they were bred - meat, milk, draught animals, or dual purpose breeds, which served as both meat and milk animals or as both meat and draught animals. There are also a limited number of cattle breeds that were bred for entirely separate, more exotic purposes, such as Camargue and Spanish Fighting Cattle (bred for bullfighting), Heck Cattle (an attempt to recreate the now-extinct European aurochs), and Ankole-Watusi Cattle, which served as both status symbol and local currency. Tropical breeds (Bos indicus), such as the Gir, Guzerat, Indo-Brazilian, Nelor, and Brahman; and the Sanga Cattle (Bos indicus africanus), such as the Boran, Nguni, Ankole, and Afrikander Cattle are physiologically adapted for expelling excess heat, not conserving it. They thrive in the heat of the tropics, but suffer if you expect them to winter graze through freezing temperatures. Those big long ears are ideal for expelling heat, but are vulnerable to frostbite. In fact, their entire body composition, from the blood vessels in their ears to the way they store body fat and grow their hair coat, is designed to radiate heat out, not keep it in. Tropical breeds thrive in hot climates that cause their cold-adapted European cousins to suffer from overheating. But their advantage in hot climates is also their greatest liability in cold climates. The nutritional requirements (and feed costs) to keep tropical breeds warm during a cold snowy winter are significantly higher than among cattle adapted to cold climates. But don't completely discount the tropical beef cattle breeds from a winter grazing program in northern climates. They have been used successfully in crossbreeding programs to combine the heat-tolerant and parasite-resistant genetics of tropical breeds with the cold-adapted hardiness of Continental and British Breeds, especially in some parts of the continental USA where seasonal temperature differences can range from tropical to sub-arctic over the course of same year. For example, Beefmaster Cattle, a relatively recent breed created in the 1930's, successfully mixed Brahman genetics with Shorthorn and Hereford to create a hardy breed capable of thriving in the climate extremes of Texas, though they have since spread far beyond the Texas borders. Brangus cattle are another hybrid breed that was developed to combine the most desirable characteristics of Brahman and Angus cattle to create a hardy, heat tolerant, early maturing breed. The British and Continental breeds (Bos Taurus) evolved to thrive in a variety of cold climates. Their body fat layers, hair growth, and entire body composition are designed to conserve heat, not expel it. The wide variations between these breeds reflects whether they evolved in cold damp coastal areas, cold dry climates of the north, high altitude or boggy lowland, temperate regions in western Europe, or in the hot regions near the Mediterranean Sea. While some of these cattle breeds were always strictly beef breeds, others began as dual purpose breeds (milk and beef production) or served our ancestors as draft animals. To this day these traits are still preserved in their appearance and adaptability. Just as the tropical breeds were not designed for northern climates, these British and Continental breeds did not evolve to thrive in tropical regions. They overheat - some worse than others depending on the climates of their evolutionary history. Because their bodies are not designed to expel heat, they essentially have a permanent fever in the sticky heat of the tropics. This leads to significantly-reduced weight gains and a whole host of health issues. It's called tropical degeneration. But again, do not discount the British and Continental breeds altogether from a grazing program in hot climates. They can be successfully crossbred with tropical breeds to bring together characteristics that allow them to thrive in hot climates. The popularity of Beefmaster, Brangus, Santa Gertrudis, Simbrah, and many other hybrid breeds or crossbreed combinations (derived by combining tropical and European breeds) is a testament to the versatility of cattle genetics, which has allowed us to mix and match the perfect combination of genetic characteristics to suit almost any climate in the world. Continental breeds include the Maine-Anjou, Charolais, Salers, and Limousin (originally from France), the large Chianina (originally from Italy), Gelbvieh (originally from Germany), Simmental (originating in the Swiss Alps), and the hardy Texas Longhorn, which evolved from Spanish cattle that roamed wild for over three hundred years after being brought to the USA by the early Spanish explorers. There are hundreds of Continental beef cattle breeds to choose, some ancient, some more recently developed. Many are known for their strong milking traits, particularly since many were dual purpose breeds raised for both milk and beef production. 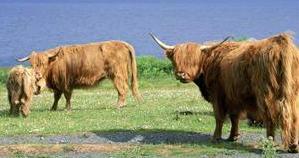 British breeds, such as Angus, Devon, Hereford, Shorthorn, Red Poll, Galloway, and Scottish Highland evolved to thrive in the climates of the British Isles. Each breed is designed to overcome a slightly different combination of wind, rain, dampness, or snow that challenged their ancestors in the regions in which they evolved. Many are known for their extreme hardiness in extreme (cold) climates. Custom climate adaptations - a closer look at specialized breed traits. There dramatic differences between beef cattle breeds evolved in response to their ancestral climatic challenges and environmental conditions. Some adaptations are evolutionary responses to thousands of years of surviving in a specific region. Others are the result of conscious decisions by humans to seek out or combine specific genetics to give them an edge in specific climates or to make them more suitable for a specific farming strategy. One such adaptation is cold adaptability. But not all cold-adapted breeds use the same solution to provide insulation against the cold. Consider the pictures of the Simmental, Angus and Highland Cattle shown earlier in this article. One uses hair to insulate against the cold and rain, while the other two rely on creating a thick fat cover on their backs to provide added protection against the cold. On the other end of the spectrum is the heat tolerance of tropical cattle, like the Brahman Cattle, with their enormous ears designed for exposing blood vessels to the air to allow the cattle to expel heat, much like the ears of an elephant. Or the Senepol cattle, which were developed for the Caribbean heat by crossing N'Dama Cattle from Africa with the dual purpose Redpoll cattle from England. While frame size and finishing weight is of less importance to feedlot operations that transport feed year-round to their cattle, there are clear beef cattle breed preferences among cow/calf and grass-finishing operations that rely on growing pasture to raise or finish their cattle for slaughter. It comes down to the length of the growing season. Where growing seasons are short, smaller framed, early maturing beef cattle breeds are preferred because this allows the cattle to be slaughtered before their second winter, which reduces costs and increases how many pounds of beef can be produced per acre because you don't need to feed unnecessary animals through another winter. Minimizing winter feed costs in the number one way to minimize expenses in cold climates. But in climates with long growing seasons there is no specific seasonal cost-advantage to having smaller-framed, early-maturing cattle. Quite the opposite actually - by opting for larger breeds you can produce more beef per cow, thus you can reduce the number of brood cows in your herd while continuing to produce the same amount of beef per acre. With less brood cows to feed, this frees up additional grass to fatten more beef cattle for slaughter. Parasites are a nuisance anywhere, but in many tropical regions they can literally tip the balance between life and death. Tropical beef cattle breeds are MUCH more parasite resistant than European cattle, whose history did not bring them into contact with anything more aggressive than fleas, flies, mosquitoes and a few nasty worms. This is why Zebu and Sanga cattle are so popular in both purebred and crossbred programs in tropical regions from India to Brazil, throughout Africa, in the Caribbean, the southern USA, and so on. But there are also big differences in parasite resistance from one tropical breed to the next. For example, the N'Dama cattle are particularly resistant to the Haemonchus contortus stomach worms of West Africa. The Red Fulani cattle are know to be more resistant to tick and insect bites. Each breed evolved to cope with the specific parasite load of its ancestral region. So make sure that the breed you choose has a high parasite tolerance for the parasites endemic to your region. When breeds have pigment around their eyes it cuts down on the glare of the sun and reduces eye strain in extremely sunny climates. Selecting breeds with this feature is a great way to reduce the risk of pink eye disease and 'cancer eye' if you live in an extremely bright climate. Some beef cattle breeds are known for extremely hard feet that are resistant to getting water logged in wet soils or stand up well to walking in rocky mountainous regions. Researching a breed's ancestral landscapes provides a good indication about what kind of adaptations you will find in each breed. Not all beef cattle breeds have horns. 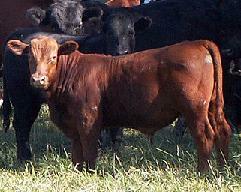 Some are polled (naturally hornless), such as Angus cattle. And some are horned but only through a recessive gene, (i.e. Highland Cattle) so that they have the unique feature of throwing naturally polled calves when they are cross-bred with any polled breed. Whether you choose to leave your horns on, de-horn your cattle, or choose a polled breed will depend on your environmental challenges (i.e. predators) and your marketing strategy. If you slaughter your own cattle, horns are much less of an issue than if your calves are ultimately sent to be finished at a feedlot. Feedlots de-horn all their cattle, regardless of age, in order to limit bruising and prevent injuries at feed bunks. They therefore will discount what they pay for cattle with horns if they have not already been dehorned by the cow/calf producer. When you're ready to start your search for your ideal cattle breed, I recommend browsing through the excellent online breed directory at Cattle International Series, put together by author/researcher Theo Oosthuizen. This site is also listed on my Cattle Links page so you can easily find it again at any time. As you begin narrowing down your list of suitable breeds for your farm, remember that you're not limited to picking a single breed - for many farmers there are significant advantages (and some disadvantages) to combining the genetic traits of multiple breeds through crossbreeding or by using a mixed breed herd. My article about purebred vs crossbred vs mixed-breed cattle explores how each of these choices impacts your cattle business to help you decide which is the best choice for your farm. Step # 5: Are there enough breeders in your area? It's one thing to find the 'perfect' breed on paper to suit your production strategy. But it can be quite another thing to find sufficient cattle from your chosen breed in your local area. Importing replacement breeding stock from half-way across the country is neither practical, nor cost-effective, nor sustainable. Pick breed(s) that are readily available within a reasonable search area close to home. Even after you buy your initial breeding herd, you will still need to buy new bulls every year to replace old and injured bulls. This means that you will need to draw from a wide range of breeders to keep up sufficient genetic diversity in your herd to prevent inbreeding. Rare breeds and some heritage breeds, despite having some very interesting adaptations that make them attractive for pasture-based cattle farmers, are only useful to a commercial beef producer if there are sufficient high-quality breeders with a sufficiently wide range of genetic diversity to be able to consistently supply you with replacement genetics year after year. Before you set out to buy cattle you need to find a reputable cattle breeder. Unfortunately pedigrees, feed trials, and award shows are not the way to identify who has the best cattle for your farm. A farm tour is far more useful - it will provide you with all the clues you need to evaluate a breeder. My article about how to spot a reputable cattle breeder discusses the clues to look for to spot first-class cattle breeders, and what clues should make you run the other way. If you'd like to learn more about breed selection and how to identify the most fertile and most efficient cattle for your herd, check out the "Genetics and Breeding" chapter of my book Grass-Fed Cattle: How to Produce and Market Natural Beef. So, what's your favorite beef cattle breed? Use the comments box below to share your thoughts about your favorite breeds and highlight the pros and cons of different cattle breeds that you've used on your farm. And if you enjoyed this article, please click the "Like" buttons on my Facebook or Twitter pages and subscribe to my email updates to get notified of future cattle farming articles!